Other than the occasional romantic reference, the only time I ever gave the concept much thought was in my junior-year college philosophy class (thank you, Whitworth University! ), when I encountered it during a unit on Plato. In “Symposium,” Plato’s Aristophanes envisions human beings as originally having four arms, four legs, two faces, etc. They were extremely powerful, and posed a threat to the gods, so Zeus, (who, in addition to being a god, was also a bit of a jerk), decided to divide them in half. (I always knew that philosophy class would come in handy some day, just like my high school algebra! Oh, wait…). Over the years, the term “soulmate” has taken on something of a romantic connotation, particularly in the U.S. — A sense of “fated lover” that is quite different from the way Europeans tend to interpret it (usually, in Europe, it has more of a “really-close-friends-separated-at-birth” connotation). With Valentine’s Day fast approaching then, and with romance in the air, this seems to be a good time to wrestle with this most vexing of Irish translation requests. When I first started learning Irish, I used to hang out on an internet Irish translation forum, and it wasn’t long before I realized that translation requests for “soulmate/soulmates” were a huge source of unease and indecision. The bigger issue, though, was that some people vociferously promoted (and continue to promote) an Irish term whose meaning couldn’t possibly be further from a romantic context (or even a good buddy context): anamchara. Anamchara means “confessor” (as in the person who hears your confession before mass) or “spiritual advisor” (as in the person who guides the spiritual formation of a young monk or priest). Even though it’s a compound of the Irish words anam (soul) and cara (friend), which might seem to make it a reasonable candidate for “soulmate,” it’s a word with a very specific meaning in Irish that has absolutely nothing to do lovers, or even with close friends (unless your best buddy is also the priest who hears your confession!). Its proponents were so adamant, however, that many of us cringed as soon as we saw the term “soulmate,” knowing that an argument about anamchara lay ahead. We called it “The ‘A’ Word,” and dreaded dealing with the people (few of them fluent Irish speakers, and none of them native speakers) who insisted they had the right to fundamentally change the meaning of an Irish word to suit their own interpretation. Irritating as the anamchara debate was (and continues to be), at least anamchara is a legitimate, grammatically sound, Irish word. It doesn’t mean what its proponents would like it to mean, alas, but at least it’s not utter nonsense. This is just a grammatical nightmare. There’s no other term for it. This construction simply can’t exist in the Irish language. What makes matters even worse is the fact that this “phrase” (can you actually call three words jammed together in no logical order a phrase?) is frequently seen on jewelry that is actually PRODUCED in Ireland (where, frankly, they should know better) and sold in Irish/Celtic shops all over the world. What’s wrong with it? Well, where to start? What’s happened here is someone’s taken three Irish words: Mo (“My”), Anam (“Soul”), and Cara (“Friend”), and put them together using English syntax. I’ve said it before, but repeat after me: Languages are not codes for one another. You absolutely cannot take words from one language and put them together in the form of another and hope to make any sense whatsoever. Seriously. Languages just don’t work that way. Sorry, but it’s true. In Irish, when you use one noun (such as “soul”) to describe another (such as “mate” or “friend”), the describing noun comes AFTER the noun it describes and is in the genitive case. I do have to have some sympathy for the tattoo seeker here. Normally there’s a little of the “Why didn’t you do your research?” sense going through my head when looking at a tattoo disaster. I feel sorry for the person with the wrong thing tattooed on him or her, but at the end of the day, it’s up to the tattoo seeker to check sources to be sure that the translation is correct. Given the source(s), though, I really do feel sorry for this person. A point I make frequently in my book is the importance of finding trustworthy resources for translations, especially if those translations are for something permanent such as a tattoo. 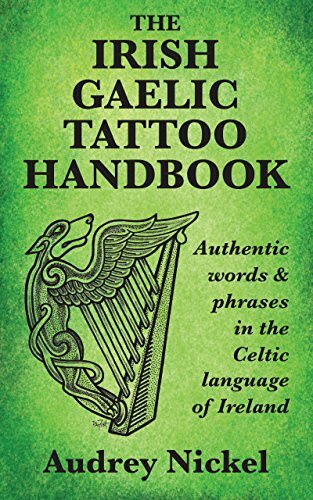 I also advise my readers not to take any Irish words or phrases they may encounter in a book, in a song, or on a piece of jewelry or artwork, as a given…even if that book, song, or jewelry comes directly from someone in Ireland. Although Irish is a required subject in school there, very few Irish people not brought up in a Gaeltacht leave secondary school with any sort of fluency in the language. And most stop using Irish much, if at all, after graduating (kind of like me and that high school algebra!). Of course there are both native speakers and fluent second-language speakers of the language in Ireland, as well as professional translators, but it seems that few writers, artists, or jewelry makers (or even sign makers!) bother to consult them. I can’t really blame anyone, though, for seeing something on a piece of jewelry from Ireland, being sold in an Irish-themed shop or on an Irish-themed website, and assuming it must be correct. Knowing what I know, after so many years with the language, I would always take such a translation to people I know to have excellent Irish for verification. But not everyone has had that kind of exposure to other languages (especially here in the U.S., where language learning lags significantly behind most other countries). It breaks my heart to see people fall victim to this kind of thing. So What CAN I Call My Soulmate? As I said earlier, Irish doesn’t have a native term for “soulmate.” It does, however, have many words and phrases with similar meanings that can be used as legitimate stand-ins. Which you use depends partially on what you mean by “soulmate” and partially on your own particular tastes. Translating from one language to another is never as easy as many people think. There are so many things to be taken into consideration: Not only word choice, spelling, and grammar, but culture and history as well. The take-away from this is always, ALWAYS get solid confirmation before using a word or phrase from another language. A professional translator is best, of course (and often much more reasonably priced than you might expect), but failing that, get at least three truly fluent speaker in agreement on a translation before proceeding. No matter what term you use for the people you love, in English or in Irish, I wish you all a happy Valentine’s Day! Lá Fhéile Vailintín Sona Daoibh! P.S. : A bonus cultural note: Those leafy things on the tattooed one’s back aren’t shamrocks. The Irish shamrock has only three leaves. Four-leafed clovers are considered lucky in many cultures because of their rarity, but they don’t have any particular relevance to Ireland. Nonsense or some sort of meaning? As I said over at the other blog, though, I strongly recommend you go to the Irish Language Forum (www.irishlanguageforum.com) for definitive answers to these questions. Would that be the best place to inquire about names as well? Question being: I am trying to find proper Irish Gaelic for Peggy (not Margaret). My birth given name is Peggy, everything usually leads me back to Margaret (again, not my name). I have seen both Peigi and Peghai, are either of these correct? I answered that for you here and on the Gaelic.co site. “Peigí” (note the long accent on the second “í”) is correct. “Peghai” is not, and in fact, violates a major Irish spelling rule. Next Next post: Welcome Springtime!